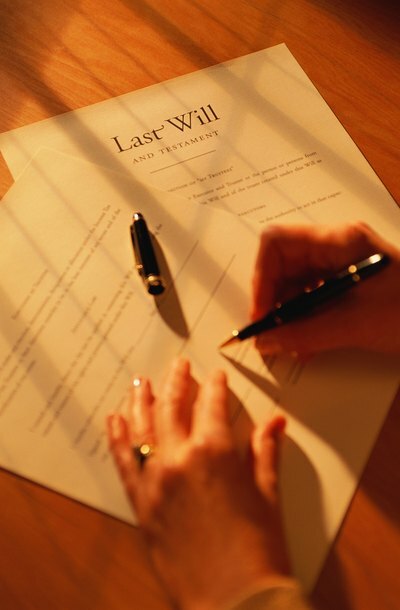 To execute a valid will, you must follow the requirements for your state. For example, Florida law requires the will to be signed by you in the presence of two witnesses who also sign the will. A benefit of a will is that it is relatively inexpensive and simple to create. However, if you choose to distribute your assets through a will, your estate will likely need to go through the probate process. If your estate must go through probate, having a will in place is a more desirable outcome than intestacy -- dying without a will -- because you can clearly identify what property you want to distribute to each beneficiary. In addition, in your will you can name an executor, the person who will manage your estate throughout the probate process. If you die without a valid will, your heirs will receive your property according to your state's rules of intestacy. In most states, your spouse and children will receive the majority of your estate. If you die unmarried and have no children, your parents and siblings will likely receive your property. If you die without a will, your estate will go through probate and the court will appoint an administrator to handle the distribution of your estate. Probate is the process of taking an inventory of your assets after death. The probate court identifies your assets and debts so that your estate can be distributed to your beneficiaries. Depending on the size of your estate and the laws of your state, your estate will most likely go through the probate process following your death, with or without a will. Probate can be costly and time-consuming. However, you may be able to avoid probate by creating a trust or distributing your property prior to your death. A trust holds your property for the benefit of the people you name as beneficiaries, and is created through a written document. A living trust is one type of trust. It can be created while you are alive and is revocable up until your death. You can fund the trust by transferring your property into the trust, but you will still have access to the property during your lifetime. In addition, you must name a trustee to manage the trust. One benefit of a trust is that the property in your trust does not go through the probate court. However, any property you leave that is not included in the trust may need to go through the probate process. Creating a trust can be expensive and requires you to manage your assets, if you designated yourself as trustee, once they are in the trust. In addition to creating a will or trust, you can transfer property to your heirs prior to your death or set up your accounts to make them payable to your beneficiaries upon your death. For example, you can create a "payable on death," or POD, account. A POD account is created with your bank and enables the individual designated as your payable on death beneficiary to receive the account balance upon your death. You can also name beneficiaries to your insurance and investment accounts prior to your death or add beneficiaries to your home’s title.